On September 6, 1776, the first functioning submarine, called the Turtle, attacked the HMS Eagle anchored in New York Harbor. 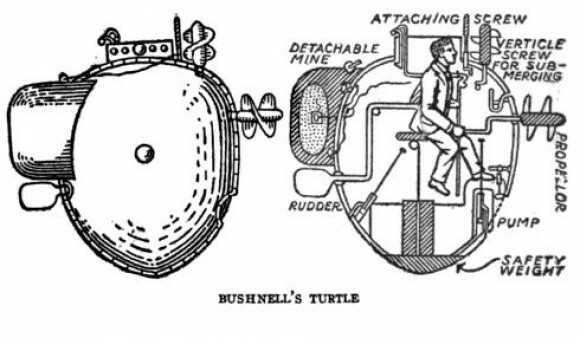 Designed by Saybrook native and Yale graduate David Bushnell, the Turtle was a one-man vessel that submerged by admitting water into the hull and surfaced by pumping it out by hand. The oak carved egg-shaped submarine was armed with a torpedo made from a keg of powder that would be attached to an enemy ship’s hull and gave Americans a secret weapon against the British—one that could potentially destroy British ships in New York Harbor. On the night of September 6 and 7, the Turtle, operated by Army volunteer Ezra Lee, made its way through the dark waters of the Harbor and conducted the attack. Problems arose, however, when the boring device operated from inside the submarine failed to penetrate the ship’s hull. The torpedo was eventually abandoned and Lee emerged unhurt. The abandoned torpedo detonated about an hour after it was released but did no harm. The Turtle would attack again, only to be discovered. It was subsequently captured by the British, and sunk with the sloop upon which it was being transported.